Does Scratch Master™ fix all damage? No, Our on-site process has limitations that depend on the severity of the damage. We repair only minor (sometimes medium) damage and provide options that range from "100% perfect", to "major improvement", to "better than it was". Upon inspection, we will tell you the expected result and you can decide. If your damage is too severe, there is no substitute for a conventional body shop or collision center. 1. Wasting time & money now. Key Question: What's the big deal about preserving my original "factory perfect" finish when performing a repair? Super important! Your original paint finish applied in the factory is the very definition & essence of "perfect". It is ideal. It was applied in an ideal process, at an ideal thickness, and baked at very high ideal temperatures for maximum durability, resiliency, & longevity. The consistency, texture & quality cannot be precisely duplicated even in the finest body shops. So when an entire panel gets repainted, even if it "looks" perfect, it's "not quite the same". There is only one "original". So, Rule #1 is: DO NO HARM! Reduced monetary value. With few exceptions, if your car has been repainted, it is worth less money. Period. You can confirm this on Kelley Bluebook or any other auto appraisal source. Your repaint gets reported to Carfax. This "red flagging" often happens unaware through various sources. When you decide to sell, the potential buyer's confidence is shaken as they question the extent of the accident. Their demand for a price reduction is in order. Your car is potentially more vulnerable to new problems such as: risking a color mismatch, checking, cracking, crow's feet,too much paint thickness thus the panel becomes more chip prone. Ever see a hood or front bumper with a ton of chips on it? I can almost guarantee it's been repainted. Potentially more vulnerable to future costs of stripping (an invasive process). For example: If you paint an entire panel to fix a small scratch, keep in mind the idea that you might have to paint that same panel again on a future repair. That panel can only handle so much film thickness before it needs to be stripped. Otherwise it can have problems. Limiting film thickness is wise. * Is Scratch Master™ really better than a body shop? Both yes & no. There is no blanket "right" answer. It's an apple to orange comparison that depends on your unique situation and the severity of your damage. What is a conventional auto body (CAB) shop? A (CAB) shop is very different from Scratch Master™. A (CAB) shop specializes in wrecks, "paint the whole panel" repairs, large damage, panel replacements & collision repair. CAB shops are crucial to the automotive industry and our communities. I truly honor the CAB expertise and they are hands down the better choice when those services are necessary as a last resort. BUT, when it comes to minor dent, ding, & scratch repairs, the CAB shop process can be a gross waste of time & money. And, they often corrupt your factory finish needlessly. Sometimes it's like getting leg surgery when all you have is a scraped knee. Scratch Master™ however, specializes in Minimally Invasive Repair Technology (MIRT). This is the art & science of keeping repairs extremely small. It's a completely different skillset and mindset. Are often ignorant to what is possible with (MIRT) especially at times when a (MIRT) repair is not super easy. Tend to "see" repairs through a CAB lens to keep their non-(MIRT) techs busy. Misdiagnose minor damage all the time. Sometimes through honest ignorance and sometimes knowingly. because they can. For your initial estimate you'll spend precious time driving around town visiting body shops and waiting in their lobby. You will then spend time scheduling two rides. One ride home after you drop car off. Another ride back to shop when car is complete. 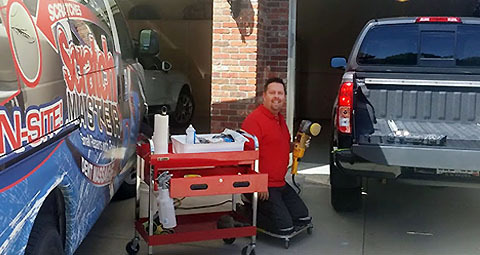 At shop you will entrust your car to 3-5 different employees, rather than just one technician. Your car will be there for days (sometimes weeks) being moved around to accommodate other jobs. In their enclosed facility, bondo dust and paint fumes are par for the course. 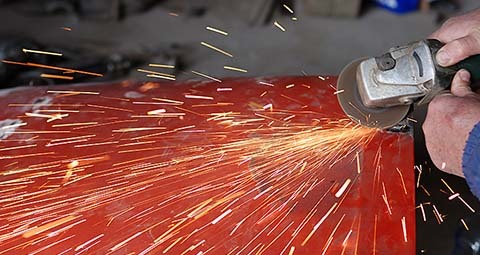 To fix your dent or scratches, body shops specialize in what is called "Conventional Repair". Conventional repair is a process of last resort. It includes replacing panels (hopefully with OEM parts), or sanding the dent / scratch, applying "filler", sanding it smooth, spraying primer, then repainting the entire panel with a finish that's "not quite the same" as the original finish. Don't forget the blend! Even a quality auto body shop often has to re-paint 2-4 (already perfect) panels to camouflage any subtle color mis-match. And the cost usually starts around $500 to $700 and can often exceeds $2,000 - $4000 depending on the damage. Don't forget the cost of a rental car, a potential insurance rate increase, and a Carfax report. Scratch Master™ is an alternative, a tool of first resort that conveniently repairs at your home or work. We specialize in helping customers avoid conventional body shop repairs when it makes sense for them. Our mission is "Preserve maximum "factory perfect" finish wherever possible and sensible." For minor dents & scratches, remember these top five things. Fall in love with your original "factory perfect" finish. "Preserving" is better than "repainting". Insist, that conventional "paint the whole panel" repairs ought to be avoided when undamaged areas can be kept in or near it's original "factory perfect" state. Hire someone who specializes in avoiding conventional repair, rather than someone who gets paid to perform conventional repair. Smart decision! Don't waste time & money on unnecessary operations!